It is with an extremely heavy heart that I write this post. Tears haven't stopped flowing since Friday night and my brain is a puddle of mush. But, I turn once again to my food blog to post because I need to find an outlet in some way. Again, I turned to my food blog to post about the loss of my best friend. 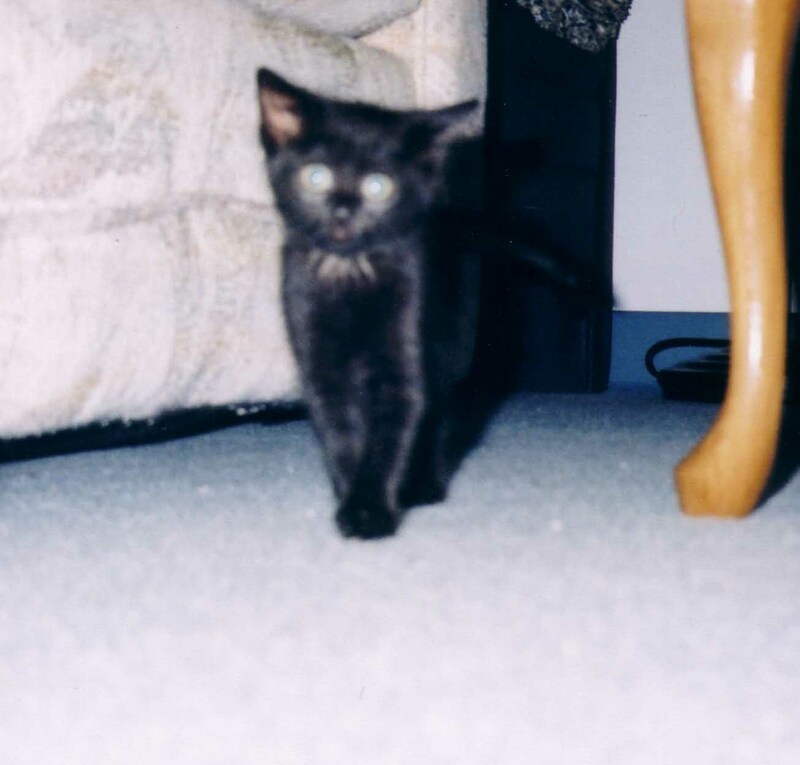 In October of 2003, I adopted the cutest, most lovable, tiniest feline of all time with the biggest green eyes. She was the color of midnight - all black - with a patch of little white hairs on her chest. (It later turned into three tiny white hairs.) She could fit into the palm of my hand. I remember my mom coming down to visit my apartment the day after Salem came home with me. "Where is she? "she asked. "Right there," I replied, pointing at her bed. "Is that her? Oh my goodness! "Salem was curled up in a tiny little black fur-ball and could easily be mistaken for a tiny stuffed animal. Salem developed some annoying little habits when she was a kitten. Early on, she found ways to get in to trouble. I don't discredit my room-mates for her upbringing; Erin taught her that flowers and plants were delectable dining and Kristine taught her that cheeseballs were toys to kick around the house and drinking glasses were full of interesting things to lap. But her most annoying habit was her inability to tell me when something was wrong. She'd be stuck in a drawer (by her doing) and buried under clothes for hours before I'd find her and rescue her. She simply didn't meow or let me know she needed help. Growing up, dogs were the prominent four-legged family member of choice in our household (save for a brief appearance by two loving parakeets). So Salem's appearance in my life was new. Pre-Salem, I had never thought of myself as a "cat person." In fact, cats baffled me. But what I had failed to realize pre-Salem was that cats have a personality of their own. They are quirky, strange, lovable, kind, and just fun to have around. 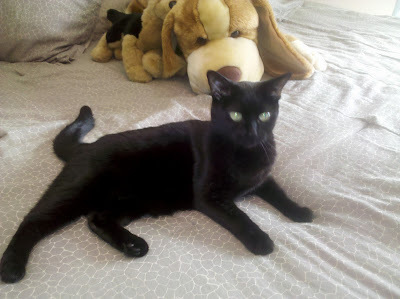 Salem loved to play hide and seek, she loved to chase me around the apartment, she loved to sprint across the room, jump on her bed, and slide into the walls. She still can't control herself and slides into walls all the time. She often found ways to break things that were twice her size. And she somehow managed to find herself in the most interesting of all locations (when the closet door is open, Salem finds a way to jump on top of it and balances). She was quite the dare-devil as a kitten and through her younger years. She still is. On Saturday night's visit at the ER-ICU, she tried jumping off the table, despite her IV's and obvious lack of energy. Salem can also be very feisty. So it was difficult to learn that she was a diabetic. It was not the treatment that concerned me but rather the fact that Salem turns demonic at the veterinarian's office. I remember asking Ron, "How in the heck is she going to spend so much time at the veterinarian's office?" Most people don't seem to understand my relationship with Salem when they meet her. Cali, our calico, is extremely friendly. She approaches people - old and new - with the same inquisitive look, tail wagging, purring like crazy. Salem is much more withdrawn. She takes a "Why are you in MY house, human?" approach to anyone, excluding me. Due to her impatience with others, people would often wonder why we had such a special bond. With me, she was on my lap purring, cuddling up beside me at night. She would play with me, jump on my desk and take over my laptop when she wanted attention... with me, she's my best buddy. She's my baby. At night, I say "Bedtime Salem" and within a matter of minutes, she jumps on the bed and curls up beside me, purring herself to sleep. But because she is feisty with everyone else, I was so concerned about the fact that Salem would spend a lot of time visiting the place she despised most: the veterinarian's office. Not only does Salem hiss and growl, but she spits, scratches, and does everything in her power to get the heck out of dodge as soon as she arrives. When I learned that Salem had diabetes, it was scary. I was confused. I needed answers and was overwhelmed by the responses on the internet. Her initial vet didn't want to treat her. He said it was a mild case - nothing serious - but I now realize that he might've avoided treatment because Salem has 'caution' stickers on her folder. In May, I decided to switch veterinarians to the local doctor in Minneapolis. He immediately recommended treatment, expressing surprise that Salem hadn't been treated yet. I felt terrible but I simply did not know, or understand, that she was desperately in need of insulin. She was started on insulin - a low dose - and developed a good relationship with a wonderful and patient doctor. I was so concerned but the vets were fantastic. Stress caused her blood glucose to rise and we were in the middle of packing for Seattle, I was never at home because I was trying to take evening courses at Hamline to finish up school. It was a terrible time to try and get her regulated... so the vet directed us to keep her on the low dose until we found a new doctor in Seattle. Shortly after arriving in Seattle, I found a veterinarian and took her in to get tested. We started the process to get her regulated. She was doing okay, despite the changes in her surroundings. But eventually, the vet switched her insulin to a more-readily available insulin. 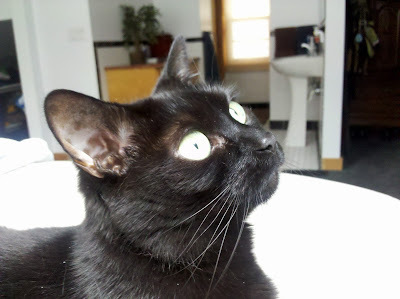 I immediately expressed concern with Salem's reaction to the newer insulin but trusted the vet's decision and insight. As weeks passed, I did not notice any changes in Salem's diabetes. I also grew concerned about Salem's insulin - it had developed a potent smell - but I was assured this was okay by the vet's office. But she continued to act funny so I brought her back in to the vet. I'm home every day with Salem so I am entirely aware of any changes in her behavior. When she doesn't eat, normally she goes back to her daily routine shortly thereafter. But she'd been acting strange. In my heart, I knew something was very wrong. Her vet appointment last Monday seemed okay. Her vitals were fine, she did not have any ketones in her urine, and her blood test came back fine, save for her blood glucose. Her BG was very, very high but the vet simply directed me to switch her back to her old insulin. I ordered the old insulin, patiently waited, freaked out with the FedEx truck had a mechanical problem and the insulin was delayed, and went to inject her insulin on Friday night. Salem's blanket since she was a kitten. 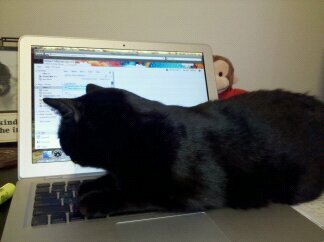 But Salem had been extremely withdrawn that day. The vet's words on Monday had seemed calming, almost as though it was just simply Salem's "case of the Monday's," but I did not have a good feeling. I did everything I could to watch after her. She was on my mind all week - like always. On Thursday, I made a donation in her name for the Tree of Hope at Petco. I wrote "Salem" on the star and smiled, knowing that she was helping another kitty. But regrettably, I waited until Friday night to act because I simply thought she would turn around once she received her new insulin with dinner. But when it was time for dinner and insulin, she turned her head and walked away and went to lie down again. She didn't come sprinting like she normally does. I immediately called the doctor who directed me to a 24-hour emergency care center. I got out her crate - she resisted so bad - but I got her in there. She was still alert. At 7:30, during a Seattle hail-storm, I packed up Salem and we rushed her through Seattle traffic to the ER unit across town. I expected it just to be a bad stomach-ache. I expected it would be a shot of an antibiotic and we'd be out of there in an hour, with Salem. Sleeping in her favorite place. No box was ever too small for Salem. The doctor took her back to examine her. He returned and told us that Salem was in DKA, a very serious and life-threatening complication of unregulated diabetes. As he spoke with Ron and explained the treatment (Salem would be held at the ICU on insulin drip, with IV, and nutrition tubes), I sobbed hysterically next to him. Immediately, I blamed myself. I still do. I should have learned how to check Salem's blood glucose at home. I should have taken her to the vet sooner. We should have spent more time getting her regulated. I should have trusted my instincts. I should have gotten her regulated before Minneapolis. And, as always, thoughts of "my God, if we only would have stayed in Minneapolis..." crossed my head multiple, multiple times. In addition to unregulated diabetes, the vet explained that Salem's situation might have been attributed to a concurrent cause. They did a sonogram. Some of her lymph nodes were enlarged; "she might have cancer," but a later test came back negative. But she still wasn't responding to the treatment. They believed she had something else - an inflammatory disease - or something else. They couldn't control it. They didn't know what it was. When we took her to the critical care center, I expected to leave with Salem. But instead, I had to walk back to her crate as she was getting hooked up on IV's. She hissed when she saw it opening. But then she recognized that it was me. She quickly got up, stumbled over, and let out the tiniest little "meow." I have never felt so hopeless. My heart has never broken so fast. I have never felt more like a parent who was desperately trying to save her child. I can only hope that her last words to me were "Mommy, Help. I love you" and not "Why? Please don't leave me here." As her time went forward and I began to lose hope, I wished we could take her home. I didn't want it to happen while she was there. But, we couldn't. We visited Salem every day she was in the ICU; it was heartbreaking. She didn't spend a whole lot of time looking at us, though I pleaded with her to fight through this. I apologized. I told her I loved her. And I begged her to understand that she was away from home because she was very ill and needed the appropriate care. Salem's condition went downhill while she was there. Despite their aggressive treatment, she couldn't pull through. Some of her numbers had gone in the wrong direction... and they were not sure why. I'm not sure why. But there were underlying issues. Yesterday afternoon, we visited Salem. She did not look well but we had heard some encouraging news. I left feeling the best I'd felt in days. 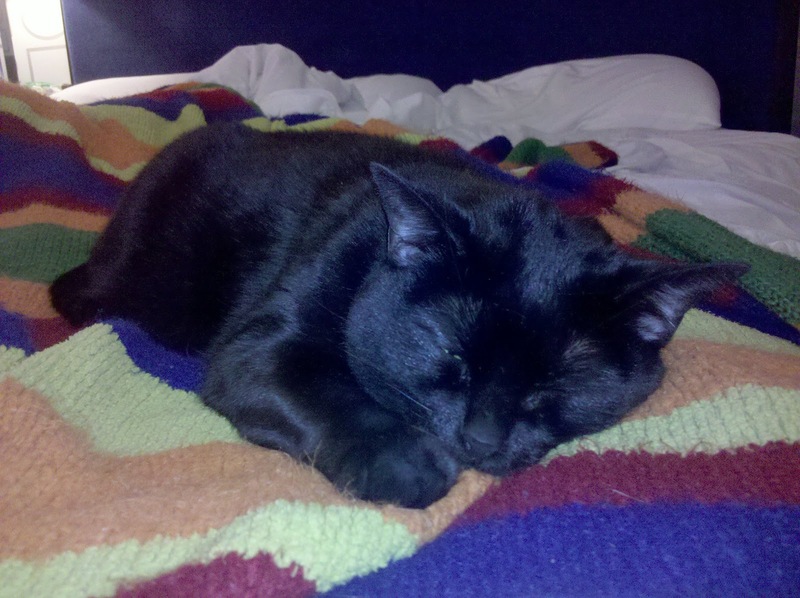 But last night, the vet called and explained that Salem was starting to decline rapidly. I asked so many questions. I pleaded. But we had to make a decision. Salem hated needles. She didn't want a life of needles. And she was hurting, hurting very badly. Ron called back. He was a wreck. I don't know how he had the strength to do it. I couldn't believe it had come to this. It went from Salem has a tummy-ache to Salem will be home in 2-5 days to Salem is not responding well to treatment to Salem might have cancer to Salem might need a blood transfusion to Salem is dying. We had figured out how to bring Salem home for the wedding. We planned to cancel the honeymoon. I planned to learn how to test her blood glucose at home. If it was cancer, we were prepared to pay thousands of dollars for treatment. But as I spent all weekend counting down the minutes until I could call the doctor again, part of my heart died each time I spoke with a vet. All weekend, I was a wreck. I couldn't do anything. I picked up a book. I put it down. I turned on the computer. I shut it off. The sun was out - it was beautiful - but I hopped on the treadmill; then stopped when I erupted into tears. 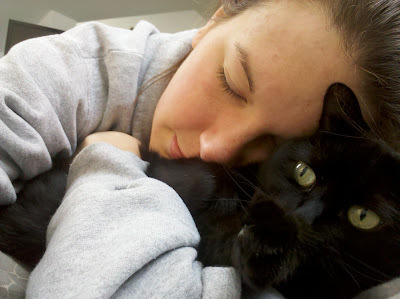 I couldn't think about life without Salem; I could not fathom it. In the past year, I've lost an uncle, a grandmother, and Madison. We've transplanted ourselves across the country, away from friends and family, and it's no secret that I haven't transitioned and hate Seattle with every ounce of my being. We're getting married in December and I'm trying to finish up school. But I'm hurting. And I've been hurting for a while. I started to withdraw last September. But I feel like I've changed drastically in the past few months. I've spent the last few months alone, in the house by myself, for a large part of the day trying to finish school independently. But I'd end up spending so much time just hanging out with the girls because I didn't have anyone else to talk with. Salem spent every day by my side. When I did yoga, she climbed on my yoga mat. When I cooked, she jumped on the counter. When I studied, she laid on my books. And when I laid down, she laid down beside me. And with the semester coming to an end, I don't know how I'm going to get the strength to continue without her. I don't know if that sounds extreme but I'm in a place that I don't think I've ever been. And even though I have so many things to be grateful for, I'm having a difficult time seeing them clearly and thinking ahead. Patiently waiting for Fancy Feast time. I only hope that Salem realizes that we didn't purposely put her in the ICU to torture her. It breaks my heart to know how bad she hated the vet - being poked and prodded - and that's how she spent her last few days. It breaks my heart knowing that she resisted going in her crate on Friday... she used to love her crate. But would she have suffered if she was at home? I guess I can't ask myself these questions. We tried everything to save her and to be able to bring her home. I hope she knows we did everything we could. I tried everything to keep her healthy while she was alive. But I think I could have done more. Salem held on until we got there. But her respiratory started to drop as soon as we arrived. One of the vet techs brought her in - the vet tech was crying, she'd spent the past few days trying to save Salem, and she apologized. We were able to spend a few moments with Salem before the vet came in. It was so hard to see her in that state. I told her to be strong. I told her how much we loved her. "Bedtime Salem," I said. I told her she was such a good little girl. And she was my best buddy. And she was going to a place where she wouldn't need to be poked with needles ever again. And Ron and I sobbed and held each-other as she passed away in our arms. Oh, Ashley. I'm so sorry. I remember losing my dog. I never thought I would be so sad over the loss of a pet, yet I still get choked up at the thought. There aren't any words to make the pain go away, but know that you have a friend in Minnesota thinking about you and excited to see you again. :) Love you! This post was just heartbreaking. I'm so sorry about Salem and so sorry she had to leave you while you're still struggling with Seattle. I know how much you loved her, and I'm positive she knew it too. You and Ron and Salem are in my thoughts and I am sending air-hugs.